Using items you already have around the house, you can create a simple, inexpensive lacing activity! I presented this activity to two different groups: a multi-age group in a home-based daycare and a group of four-year-olds in a childcare establishment. In both cases, it was a big success! I used store-bought modeling dough because I didn't have time to make my own. 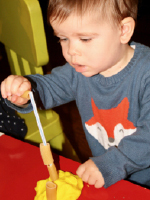 Drinking straws and skewers: Consider the ages of the children when picking the type of tools you will offer. 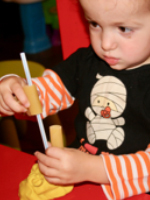 I used drinking straws when younger children were present and skewers with the group of four-year-olds. Whichever you decide to use, constant supervision will be necessary to avoid children using the straws or skewers as swords. It is also very important that children not walk around the daycare with them in their hands. 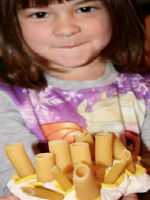 Pasta: Pick a type of pasta that, due to its shape, will be easy for children to thread onto the straws or skewers. Make sure the pasta pieces are big enough to fit over the accessories you are planning to use. I used larger pasta for use with the drinking straws and smaller pasta for use with the skewers. At first, give each child a small quantity of modeling dough. Let them manipulate it as they wish. After a while, ask each child to form a ball with the modeling dough. Distribute drinking straws and skewers. Ask children to prick them in the modeling dough. 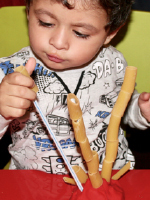 Pour the pasta pieces on the table and encourage children to slide them over the drinking straws or skewers. This activity can easily be adapted for young toddlers. However, you will have to stay very close to little ones and use drinking straws. Avoid using skewers due to their pointy tips. If they have one, give toddlers their pacifier to prevent them from putting the straws in their mouth. 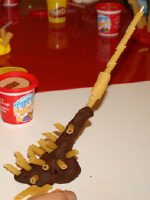 Pasta and modeling dough are both great items for encouraging children to be creative. 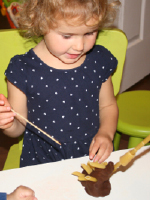 Even without drinking straws and skewers, this activity can be interesting for children. They will have fun combining them to create unique structures or simply pressing the pasta pieces in the modeling dough. Children also enjoyed rolling the larger pasta pieces in the modeling dough to create tracks, much like car tracks.